“Information is power!” stated Dr. Elizabeth (Betsy) Lamb, NYS Integrated Pest Management (IPM) Program, Cornell. Lamb was leading a “Creating an Integrated Pest Management Plan” program in partnership with Cornell Cooperative Extension of Chenango County at Norwich, NY. Brian Eshenaur, NYS IPM, plant diagnostician/plant pathology, Cornell Senior Extension associate, and Debbie Palumbo-Sanders, Bioworks, also took part in the “Getting the Good Guys into Your Greenhouse” hands-on workshop. Biological control means managing pests through use of the beneficial action of other living organisms; parasites, pathogens and predators are usually known as natural enemies. “Biocontrols are organisms whose sole purpose in life is eating others – in this case eating pests that attack greenhouse crops,” said Lamb. Biological control limits or reduces use of chemical sprays, which can cause personal and environmental issues. Additionally, pests are showing an evolving resistance to pesticides. Greenhouse operations use large amounts of pesticides and fertilizers. Now, due to new regulations and consumer demands, growers are turning to biocontrol as an option. “My customers are saying ‘Please don’t spray your plants!’” reported workshop attendee Al Heywood of Heywood’s Greenhouses, Remsen, NY. Some of those pieces to consider include greenhouse structure, lights, temperature control, ventilation and flooring – are you growing in bunches on the floor? Are you using sanitation? What’s outside your greenhouse? Consider pests you’ve had in the past and what options you had for controlling them. Have you treated for aphids? Spider mites? Powdery mildew? Identification of your specific pest is important. Although some beneficials will target the same pest, some do not – and some, unfortunately, will target each other. “It’s a rove beetle-eat-predacious mite world out there!” Lamb remarked. Therefore, timing of releasing your beneficial agents comes into play. Lamb said to consider that different pests are found in different places. “Consider that insects fly at different heights,” she said. Thrips are found in soil, while aphids, fungus gnats and white flies will be found elsewhere. While rove beetles work well on floors, parasitic wasps, predatory mites, predaceous midges, ladybird beetles, lacewings, hover-flies and nematodes all have their places in the greenhouse setting as well. Yellow sticky cards lure and trap winged adult pests, alerting growers to their presence, location and possible infestation. Daily scouting and plant inspections for aphids is emphasized. Heat, humidity and other environmental factors will impact pest occurrence. During the “meet the biologicals” portion of the demonstration presented by Lamb and Eshenaur, folks were able to observe predators under the microscope and with handheld lenses at different stages of their life cycles – and also see them at work destroying pests. Eshenaur explained to attendees that while other beneficials eat their prey, tiny parasitic wasps (called parasitoids) lay their eggs inside or on the body of their prey. Although usually only one egg is deposited per host pest, the wasp may lay hundreds of eggs per day. Parasitoid larvae then feed on the host, destroying it. Mummified aphids were viewed under lenses. Parasitoids are common and extremely important in controlling insect pests and are extremely sensitive to insecticides and chemical sprays, as are other beneficials. Lamb noted that spider mites overwinter, and advised using caution when bringing in new plants. “They may have spider mites in them. 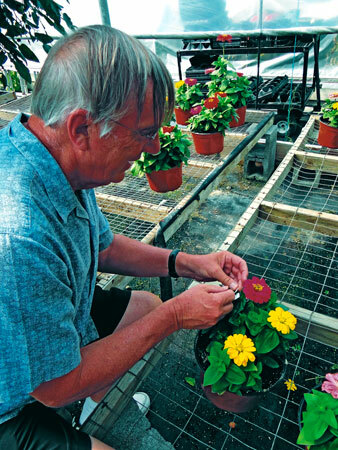 Treat plant material as soon as it comes in before potting.” Dips are available for treating. Some pests—like aphids—have to have plant material to survive, but others—like spider mites—do not. Thrips lay eggs in plant material, and new plants may look clean to you, but in reality they are not. “When bringing new plants into your premises, isolate when you can, as much as you can,” advised Lamb, recognizing the fact that everybody’s situation is different. “We’re not trying to be organic, we’re trying not to spray,” said Lamb. In a presentation of “How you grow matters!”, Debbie Palumbo-Sanders of Bioworks explained that there are products that work well with beneficials. EPA accepted and registered, Bioworks offers biochemicals that have been tested in laboratories and greenhouses and are proven to be safe and effective. Products including bioinsecticides from fungal-based products and Azadirachtin-based products, and biofungicides from bacterial-based products and mineral-based products, were among controls discussed. Plant diseases such as powdery mildew are targeted by these products. These products have complex modes of action with a low likelihood of resistance development. A discussion ensued about the use of mineral oil and other oils used to smother pests (insects breathe through their spiracles) without harming plant leaves. Palumbo-Sanders said biological products are “not a silver bullet” but work in conjunction with other biocontrol methods and are proven to be safer for workers, consumers and the environment. “They will improve plant, soil and environmental health over time with continued use,” she said. Attendees of the workshop proceeded to Pires Flower Basket in Norwich, where Lamb demonstrated application methods of predatory beneficials, including rove beetles and predatory mites, encouraging attendees to participate. When purchasing beneficials be sure you know who you are buying from, advised Lamb. It is also important to note that they should be kept at a specific temperature, usually under refrigeration, until they are released. “Read labels, follow directions, look at expiration dates and keep records,” she emphasized. Document dates and specific pests and species of beneficials used for control. What plants or areas were treated? What are your results?